The first requirement for any spa is it has to be in a beautiful location. 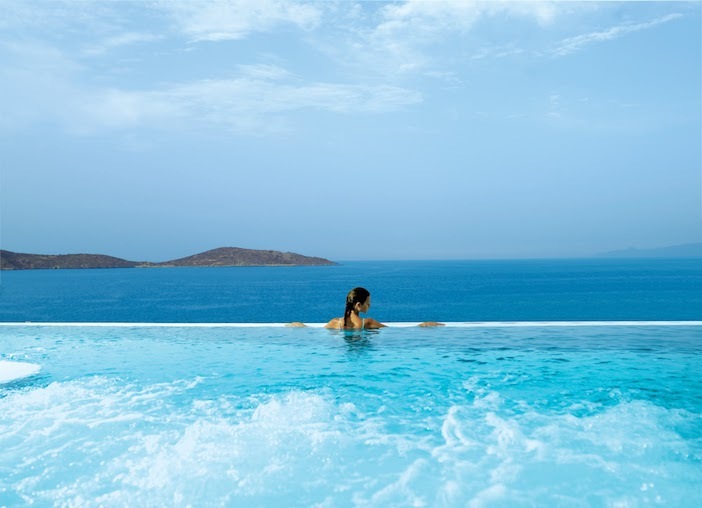 The Six Senses Spa at Elounda has this one nailed. I’m staying at Elounda Mare, the first in what is now a trio of hotels strung along beautiful Elounda Bay in Crete. This seascape is magnificent. The wide expanse of sea turns from aquamarine to turquoise. Lines of cliffs and behind them mountains range into the distance. On the bay in front of us – and it really is just in front with our deck overhanging the rocks and the lapping waves – are some pretty impressive yachts available to hotel guests for charter (very popular with honeymooners, I’m told). The Major and I are in a “bungalow suite” and that means your own house with a garden and salt-water pool. Inside, there are a big sitting room, bedroom, bathroom (with incidentally one of the best hotel showers I have ever discovered that operates with push buttons instead of lots of dials). The bathroom is full of wonderful extras, too. Not for Elounda just the usual handful of tiny shampoos and shower gels. Here, there is a special hand cream, a foaming cleanser for face and eyes, a natural sponge and a rather wonderful hairband. 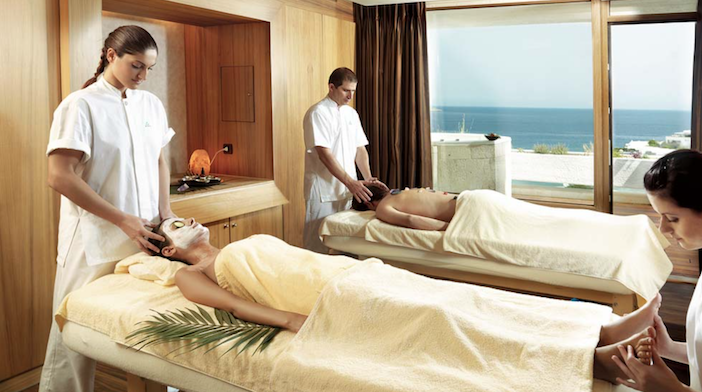 So, there is a feeling of comfort and cossetting (the next requirement in a spa) and it’s no surprise that this was the first Relais et Chateau in Greece and still the only one on the island of Crete. 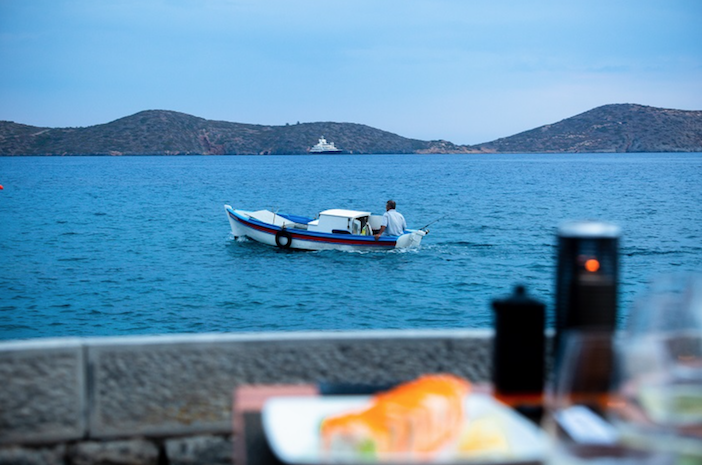 Over the three hotels (you can access them all by shuttle) there are ten places to eat but for our first evening we decided to stay in Elounda Mare and go to the Yacht Club restaurant – and this being Friday, it was Fish Night. So there’s a buffet style first course with local delicacies (squid, octopus, mussels, salads) – plus a sushi bar. Afterwards comes the fish plate – a selection of around five different fish fresh from the water that morning. Delicious but it defeated me – though not the Major who went on even to eat a pudding, a man enslaved to anything connected to espresso. The following night we went to the Old Mill, Elounda’s top fine dining restaurant. This is, unsurprisingly, a destination for foodies across the island and the cooking is superb. The Major had veal as his main course and said it was the best he had ever tasted. My beef was sensational and the location is, yet again, stunning. Wherever you are in Elounda you are next to the sea and surrounded by gardens. I wasn’t just there to eat, though. I was also there to sleep. 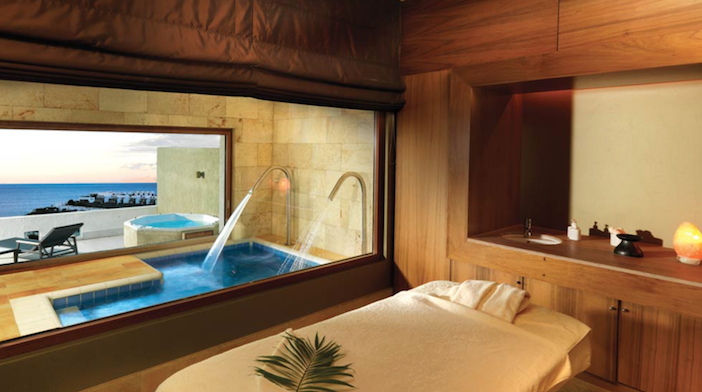 That is, I was embarking on a “Sleep Well Journey” at the Six Senses Spa, designed to improve sleep, boost mood and relax on every level. This sounds particularly wonderful to me as a long-term insomniac. The Major who was giving it a try, too, has no problems on this front, being one of those people (highly irritating to the sleepless) who is out like a light the moment he hits the pillow. Our first session was with Irini who gave us a yoga class designed for relaxation and sleep promotion. So after some long gentle stretches, she took us through some pranayama – yogic breathing, alternating between nostrils – and then into one of the best led visualisation-style meditations I’ve ever had. They always sound a bit daft when you try to describe them (this one was all about light and chakras) but, for me, it really was good. For the Major, sadly, it was somewhat marred by his feet going to sleep being unused to sitting cross-legged. We spent a couple of pleasant hours around the heated sea-water pool and the hydrotherapy rooms (saunas, steam and cold water plunges). This is a big beautiful spa (the Sunday Times travel magazine has voted it the world’s number one) and there is water everywhere here, in pools and fountains and running through the channels of local golden stone, just like they did in the Minoan Palace of Knossos, a couple of hours drive away. In the upstairs relaxation area there’s a pool that forms the ceiling of the downstairs relaxation room. 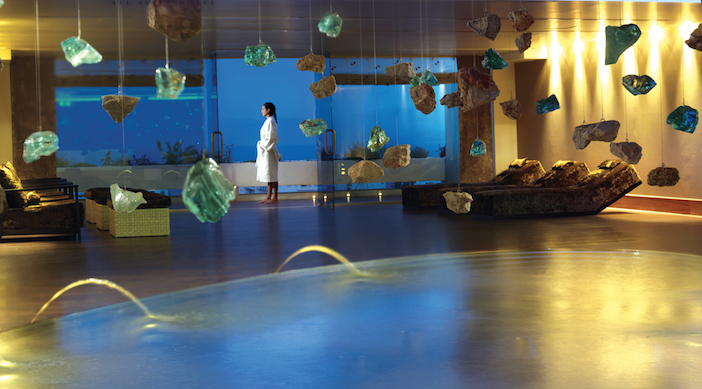 Above the water, rocks and crystals are suspended and fountains pour more water that then cascades over the pool’s edge. Stunning. And then it was time for our massage. This wasn’t any old massage, but a Blissful Marma Massage. Marma is very different from most massages and in the Six Senses version it brings together a mixture of massage styles including traditional Ayurvedic, lymphatic drainage, reflexology, aromatherapy and the chakras. Designed by the spa’s product partner, Subtle Energies, the air is infused with jasmine, sesame, sandalwood and lavender; and the session begins and ends with a “singing bowl” which I not only hear but feel – it is placed on my body and its reverberations echo through my bones. Some of the differences with this kind of massage are simple and immediately obvious. My therapist, Vassilis begins, for instance, by working entirely on my left side from foot to shoulder and then moves on to the right to do the same thing. Or almost. Marma is very intuitive and personalised so, when he comes across something specific, he addresses it. On my left calf he applied a kind of soft clapping movement. However, it didn’t happen on the right where there was not, apparently, the same knotty problem. But, speaking of knots, boy, did he find some in my shoulders. The ones on the right were worse, no doubt due to carrying bags as a rule over my right shoulder. A good argument in favour of backpacks. The Ayurvedic tradition continued the next morning with shirodhara and nasya again with Vassilis. To be honest, I was a bit nervous about the nasya as, having had this in a traditional Ayurvedic setting, I remembered it as something akin to water boarding. Not here, though. “Nasya oil” was applied to each nostril in turn with the same single-nostril breathing I’d done the previous morning during pranayama with Irini. No stress there then and certainly no streams of water up my nose. And then it was on to the Shirodhara, a treatment that some claim to be the massage form of meditation, one that produces a blissful state. Quite a claim. 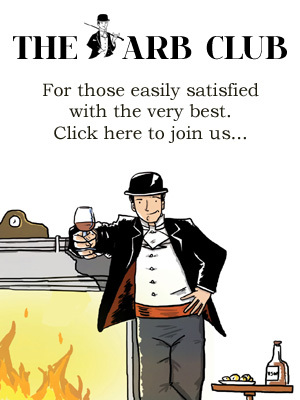 I have had this a couple of times before and actually found it a bit boring. This time, it was a much better experience, so much so that, rather than being bored, I was sorry when it ended and could have stayed for quite some time under the flow of warm sesame oil. This falls on to, principally, the Third Eye, but also back and forth across the forehead, up along the hairline and over the crown. Sometimes it’s a steady flow, then it’s little spirals, then it’s a pitter-patter, then it’s single drops. It does, of course, have that ability to draw the wandering mind (and boy does mine wander) back to a single point. Afterwards, I felt completely zoned out (and Shirodhara had certainly never done that before). My heart rate had slowed (checked the fitbit) and I felt like everything else had too. I sat and drank my green tea out of my tiny cup and watched the water playing on the “pool” of the upstairs relaxation room. Completely at peace and in a perfect state for a good night’s sleep. Elounda Mare offers a one-bedroom Suite from €323/£297 per night on a B&B basis (based on 2 people sharing). For more information, visit www.eloundamare.com.